Sign Up for the Word of the Day! 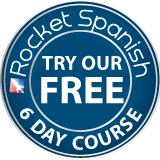 Subscribe now to receive your Spanish Word of the Day and grammar tips! ©2019 RLCO Learn Spanish. All Rights Reserved. The Imperfect Tense - Imperfect Indicative By Russell Sabo When you want to talk about something in the past that you used to do, something that was happening when another event happened, or something that happened and is still happening, you will use the imperfect tense, or the imperfecto de indicativo.